Growing up, Sunday suppers were a big deal in our house. The meal almost always revolved around meat (though once there was a poorly received tofu lasagna) and potatoes. She’d start preparing the meal early in the morning and when I’d wake up, she’d enlist my help to peel the potatoes and carrots, chop the onions or in the case of beef stew, flour and season the stewing beef. Beef stew is a huge comfort dish from my childhood and something that was prepared only once or twice a year, though I would have gladly eaten it once a week. 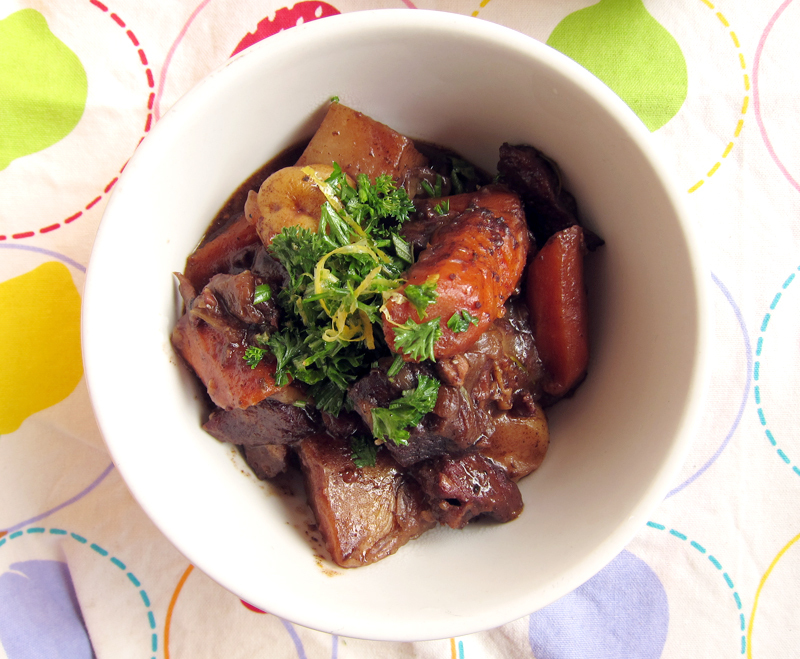 We were all a huge fan of the boeuf bourguignon, which is how it was known in my household. I don’t cook a lot of meat in our house, but when I spied some nice looking stewing beef at my local butcher, I figured that turning it into a comforting beef stew would make an ideal fall supper. Baby potatoes, local carrots, fresh herbs and a big ol’ onion melt down with the help of some good red wine and beef stock. It’s a dance of comforting proportions. Slow cooker update: A lot of you asked in the comments about a slow cooker and I don’t have one, so I couldn’t advise. However, Nicole, who blogs at Dula Notes, says that this stew is great in a slow cooker cooked on low for 10 hours. Thanks Nicole for the great tip! But the real kicker here is the gremolata. Now don’t get all uppity about gremolata because it’s simply a fancy word for some freshly chopped herbs, lemon zest, sea salt and a small drizzle of olive oil. It seems humble enough, but when scattered over top the hot bowl of stew, it releases some seriously delicious scents and flavours. elsewhere: Pop on over to Poppytalk if you fancy a quick and hearty vegetarian meal – a golden lentil dal with ginger & orange. 1. Preheat oven to 350F. Dump the flour onto a large plate and season with salt and pepper. Dredge the beef cubes in flour. Heat a large dutch oven over medium heat and add in oil. Brown the beef on all sides – be sure not to over crowd the pot or else the beef won’t brown easily. And browning here is all important, so brown each piece well (but don’t burn!) in batches until all the beef is browned. Remove beef and set aside. 2. Add in onion and additional oil if needed and saute until coated in oil and starting to get soft – you want to stir frequently and try to grab all those bits at the bottom of the pot. Add in the garlic and carrots and stir that around too. Pour in the wine and now is your chance to truly loosen all those particles hanging out at the bottom. When you’ve got the bottom clean, add in the beef broth, bay leaves, rosemary and browned beef cubes and bring the whole shebang to a boil. Add in potatoes, cover pot and place in oven. 3. Let cook in oven covered for 2 hours, giving a stir occasionally. Reduce heat to 200F and cook for another 2 hours, still keeping the pot covered. The liquid will have reduced considerably but there should still be a good gravy. The vegetables will be tender and the beef should be melt-in-your-mouth. Ladle into bowls, serve with red wine and a good rustic loaf of bread. Top each bowl off with a spoonful of the gremolata. Serves 4. Combine all ingredients into a small dish and serve a spoonful over top each bowl of stew. Also, really tasty mixed in with salad or coleslaw. Heya, can this be made in a slower cooker while one is hiking and canoing?? thanks in advance!!! 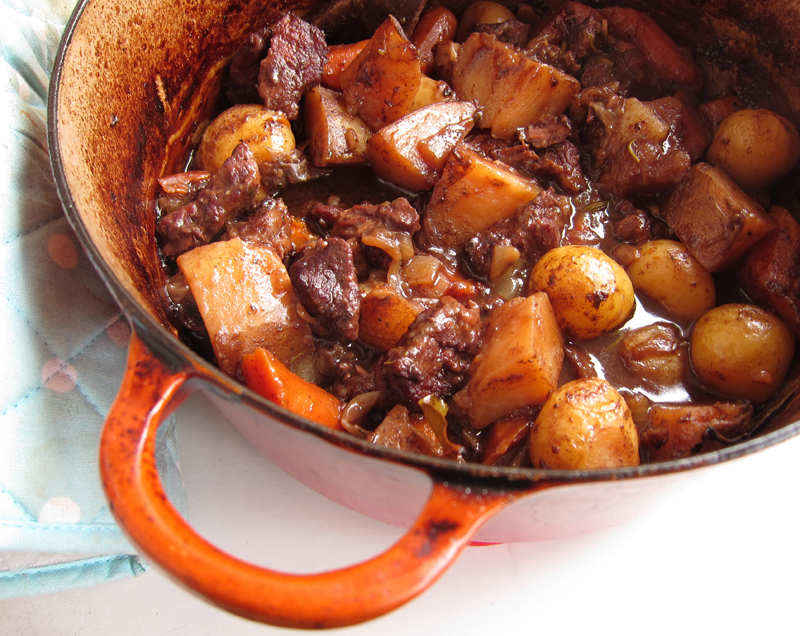 Love beef stew–and this looks perfect! Thanks for sharing this recipe—I can’t wait to try it! Adventure Nell asked the very thing I was thinking! Adventure Nell & Peggy, I don’t have a slow cooker nor have I ever cooked with one, so I can’t say for certain. Maybe you might need to increase the liquid, but I think it should work out all right. If you do try, please let me know! I long for things like beef stew when the weather turns colder, and it finally FINALLY did today. Great timing! 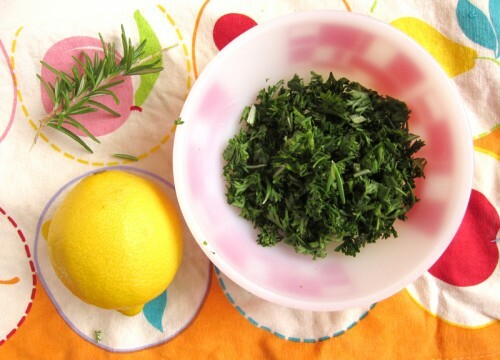 That gremolata sounds like a lovely way to add new life and vibrancy to a heavy stew! Nigeria is hotter than the last chamber of hell but I really want to make this so I definitely look forward to it. Now to hunt for the ingredients……. Thank you this sounds delicious. It’s finally cooled down enough to start making a hearty meal like this. Thanks for sharing! It’s 34 degrees here this am and this would be perfect for Halloween weekend. Love your post. Great memories! Adventure Nell and Peggy – This recipe is very very similar to the one I grew up with and my mom always did it in a slow cooker. Lid stays on, liquid doesn’t leave so you actually have to cut the liquid amounts in half. Happy Cooking Everyone! Mags, perfect timing indeed. It’s awful here – total beef stew weather! Stay warm! Joanne, it totally does. Thanks. Oooh, I can imagine! Good luck on the search, Wendy! Allison, thanks for the slow cooker tip! Good to know for the folks who asked! Thanks everyone! I am going to make on Sunday so will let ya’ll know how it works out with the tip that Allison provided. I am new to cooking and this sounds delicious, but I avoid flour. What function does the flour have, and can I substitute it with something else? Hope it went well, Adventure Nell! Michelle, the flour helps to thicken the broth so it turns into gravy rather than soup. Browning the meat with it helps to cook the flour so it doesn’t have a flour-y taste. You could just add in a little cornstarch mixed with water or stock near the end to create gravy if you don’t eat flour. I happen to believe that there’s nothing like a meaty stew to make you feel quite at home. Thanks for sharing! I’m making this right now and the whole house smells amazing. Jeannette, what kind of wine did you recommend using? Michelle, so glad you’re giving this a try! I’m not much of a wine snob, so I think anything you like to drink would work well here. I think I used a good Spanish wine here, but go with what you’ve got! 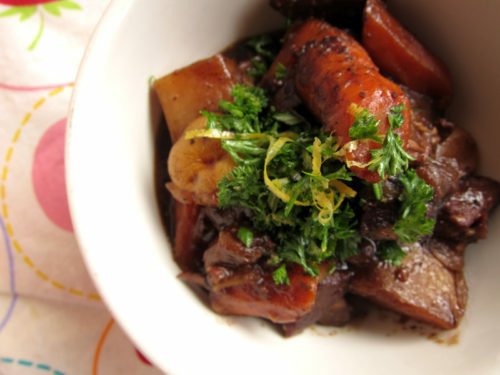 Warm, hearty stews like this one are exactly why I love fall. Looks delicious, Jeannette! Definitely on my list of things to make asap. I seldom buy beef and when I do it’s solely to put a smile on my husband’s face. I should make this stew and surprise him one day. I like the sound of the gremolata too. Thanks for sharing the recipe! NicoleD, we rarely eat beef at home so it’s a nice change of pace – I’m sure your husband will appreciate it! Thanks so much for your sweet words, Kathryn! Hooray for fall! Hmmm, seems to be a beef + husband theme here, Bijoux! The gremolata is great here and if you have any leftover, it’s great in a salad too. I made this tonight for dinner. I wasn’t planning on eating any but I just couldn’t resist. The aroma was intoxicating. And you’re right! The gremalata was superb. I added a garlic clove to it too for that extra punch. Wow! This was SUCH a fantastic recipe!! Thanks for sharing! Reheats nice for lunch, too! Bijoux, so glad you tried this & loved it! I think the added garlic would have been awesome. Yay! Success with the crock pot! Smelt divine and tasted wonderful. I seared the beef and cooked the onions before popping everything in the pot for a low cook of 8 hours and it turned out excellent. The potatoes and carrots did not disintegrate and the wine pushed it over the top. I did not add salt as I used beef/veggie stock, just added lots of fresh cracked pepper. Thanks!!!!!!! Adventure Nell, glad to hear it held up well in the crock pot! Hooray! Thanks Charles, let me know how it goes! For all who have asked, the stew is wonderful in a slow cooker – 10 hours cooked on low. Thanks to Nicole for the tip! I made this. It had the deep beefy flavors of a “traditional” stew, but the gremolata added a much needed fresh contrast. My brother immediately identified the use of red wine. My wife appreciated the “comfort food” aspect. If I make this again, I’ll double the carrots and add parsnips and halve the potatoes, which seemed more like filler to me.